With a distinctive table top that can be seen looming over the surrounding countryside, Cuilcagh stands at 665 meters and forms the highest point of both Cavan and Fermanagh. This mountain is commonly approached along a way-marked trail from the North that starts near the Marble Arch Caves, however at the time of writing – November 2010 – I understand that this route is closed due to a local landslide. Our walk took a total of 3hrs 45 minutes. The R200 near Swanlinbar is a lonely road that climbs into the russet coloured grassland of the Bellavally Gap as it makes its way west, and it’s along this road that we parked at the entrance to a small track. From here we walked back down the road for a hundred meters or so before beginning our walk up another track that winds up the hill towards a telecoms mast. The track will bring you half way up Benbeg, at which time you need to climb through long grass along a fence before crossing a crude stile just shy of the top of the hill. Almost immediately after crossing the stile you come to the edge of the ridge which sweeps all the way around to Cuilcagh. It drops off quite sharply so I’d advise against walking with your head buried in a map or GPS device! Watch your step at the summit of Benbeg, those meat eating sheep are waiting for their next meal. From the top of Benbeg we could see our route around the ridge to Cuilcagh laid out before us. To the west increasing numbers of low grey clouds were moving in, so we pushed on to make ground before any bad weather picked up. The going from Benbeg features a good deal of peat hags, which I negotiated carefully as I was still minding a sprained ankle from a couple of weeks ago. I’ve seen comments that navigating this route in bad weather could be difficult, though in my mind if you stick near the edge of the ridge which is pronounced all the way you can’t go too far wrong. 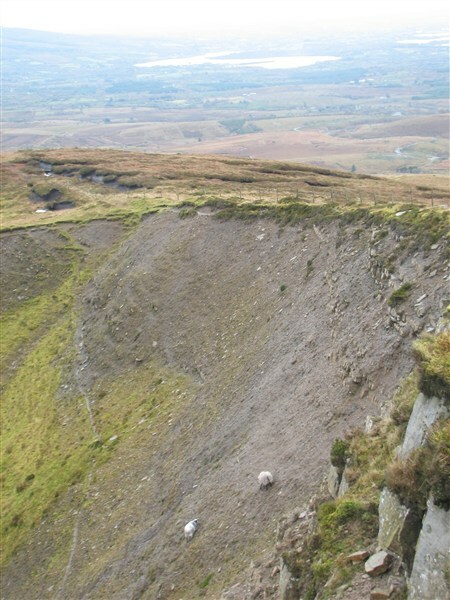 The limestone nature of the Cuilcagh mountains becomes apparent as you make your way up the mountain, with outcrops of fine stone hanging over the rim of the hill. In fact, the geology of the area is so remarkable that it is part of the world’s first international geopark. For the last couple of hundred meters of the walk the ground steepens somewhat, though the going is never too strenuous. For us, a howling wind kicked in over a matter of moments as we approached the summit, with clouds streaming up the hillside and over the plateau. With closed eyes the roar of the wind sounded like distant surf and it was ‘proper cold,’ I reckon about 1 degree celsius. We took shelter and coffee in the lee of the large summit cairn and spotted the odd glimpse of the land and lakes to the north before deciding to head back down. 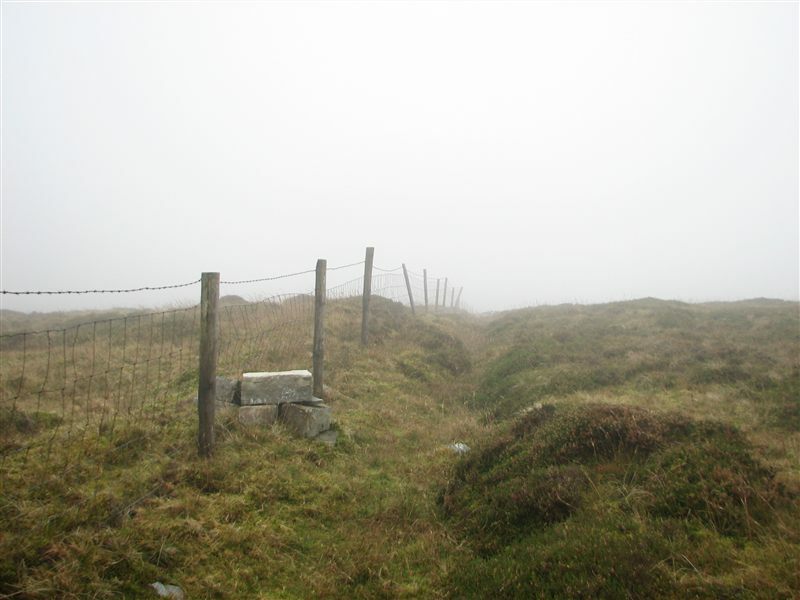 We had planned to walk out along the ridge to take in the Cuilcagh Gap and Tiltinbane but with the worsening weather and low visibility this was not an appealing option. So down we went, retracing our steps, glad of the chance to drop down out of the wind and warm up again. I don’t think we saw the best of Cuilcagh this time around, I’d like to return and climb the mountain from the northern start points of Florence Court or Marble arch caves as these route – linked below – sound great. Here’s a fine route description for Cuilcagh written by Deirdre Davys. As mentioned above, a waymarked route up Cuilcagh can be followed from Florence Court. You’ll find a wealth of information by following the link above to the WalkNI site. However, note that there’s currently (November 2010) a route closure in effect for a stretch of the walk. Here’s a great route from the BBC that takes in the Cuilcagh Gap, starting near the Marble Arch Caves – which sound like they are well worth a visit themselves. 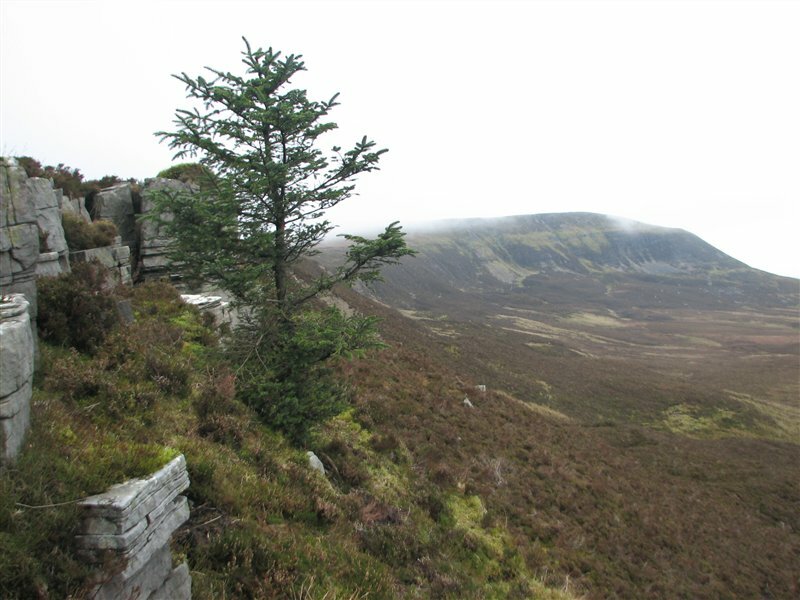 As ever, Mountainviews.ie has lots of route information for Cuilcagh. Thanks for the update Trailtrekker. Do you happen to use Mountainview.ie? I’ve posted some information on access to Cuilcagh there in the past, but your updated information would be of benefit to users of the site. If I don’t hear back from you I may post this information to the site. I hope your walk goes well…and you are able to follow the directions! Please feel free to post the information on mountainviews, by all means, I have not yet regsitered myself on it. We did the walk last Saturday and the Walk NI directions are spot on, the waymarking is pretty good too. It took us over five hours though!! Over 90% of trek is bog and no matter how good the boots or what type of gaiters we all had very wet feet by the end. The last section of the route is more than steep also, its a good old scramble and a fence (which I think marks the border) is of great assistance, particularly on the descent. We got a good day for it after a reasonably dry spell, I wouldn’t like to dare this route after it being really wet. It was strenous, wet and smelly, but fun. There are definitely easier ways to get to the top of Cuilcagh, but it was a good experience. That sounds like it certainly would be a route to avoid after wet weather. I would like to approach from the north side sometime though as the day I visted was horrible. I did put your information up on Mountainviews. You should register, it’s a great source of information on pretty much every hill in the country. I did the walk to Cuilcagh top from and back to the Marble Arch Geopark car park on 28th July 2012 as part of a ten county tops weekend. The landslide is easily passable although the ‘closed’ signs are still up and there is no forestry on that route. I’d love to both visit Marble Arch caves and hike Cuilcagh from that side. Must get up there sometime.